Azamara Club Cruises is to buy P&O Cruises’ ship Adonia, taking its fleet to three ships. The 30,000-ton ship will join Royal Caribbean Cruises’ upmarket Azamara fleet in March 2018. It will be renamed Azamara Pursuit and will join two similar-sized ships – Azamara Journey and Azamara Quest. The 704-passenger ship will undergo refurbishment before Azamara takes delivery. Information about deployment and itineraries will be released in October. Adonia’s last cruise for P&O will be on February 23 to March 9 starting and ending in Barbados. 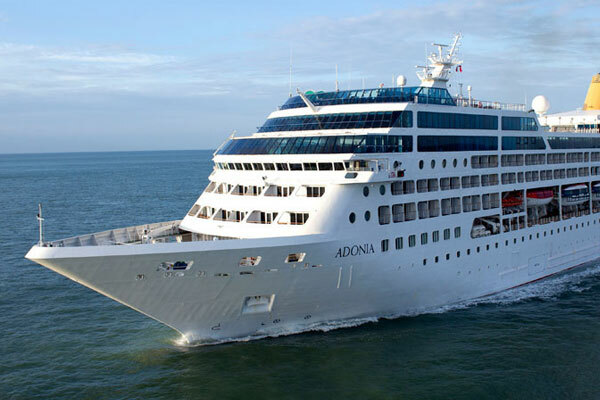 Adonia returned to P&O’s fleet in Southampton in June after a year on secondment to social impact brand Fathom when it ran the first US sailings from Miami to Cuba in 50 years. Most recently, the adults-only ship has been running a series of “discovery” itineraries with P&O, including a seven-night cruise to Bordeaux, Honfleur and Guernsey. P&O Cruises senior vice president Paul Ludlow said: “During her time with us Adonia has captured the hearts of many thousands of P&O Cruises guests. She has ventured into new ports of call around the globe and has negotiated Icelandic Fjords, European rivers and Caribbean coves. We will ensure that these discovery itineraries are continued on other ships in the fleet. President and chief executive of Azamara Club Cruises Larry Pimental said: “We are pleased to expand our portfolio by 50%, allowing us to visit even more regions of the world through the acquisition of this sister ship. Last year, Pimentel described extra capacity in the luxury cruise sector as “too much, too quick and too fast” and warned it would drive down prices. Earlier this month Silversea Cruises announced it would launch a new ship in 2020 and unveiled plans to build two more. Ritz-Carlton also revealed its plans to enter the cruise sector with three yachts, while Celebrity Cruises has three ships on order, Ponant has four, and Crystal Cruises, Scenic, Seabourn and Star Clippers also have new vessels set to launch. The Carnival Corporation announced Monday it is launching the world’s first over-the-top digital streaming channel from a travel provider. OceanView will be completely free to access on land and at sea and will feature a unique mix of travel content for viewers around the world. Original shows from Carnival’s OceanView channel are now available on major digital streaming platforms Amazon Fire TV, Apple TV and Roku. The OceanView channel will be found on the Ocean.com website and more than half of the Carnival Corporation’s 103 cruise ships by late October. The digital streaming channel will feature more than 100 Ocean Original episodes, including the company’s four original series and its two direct-to-digital streaming series. Carnival will celebrate the official availability of OceanView Thursday and will also demonstrate its new PlayOcean interactive gaming platform, which includes two new mobile apps and onboard, location-based experiences for guests. GO and Local Eyes, the two direct-to-digital streaming original series, will run 10 minutes per episode without commercials. GO follows explorer Trek Thunder Kelly on his many adventures using visually stunning cinematography, and Local Eyes explores unique destinations with the help of residents and host Anji Corley. OceanView also includes programs from the company’s One Cruise Experience Access Network original content portfolio. Guests will be able to watch episodes of Vacation Creation”(ABC), Ocean Treks with Jeff Corwin (ABC), The Voyager (NBC) and Good Spirits (A&E Networks). New speed restrictions on ships sailing waters in eastern Canada where North Atlantic right whales have been congregating have forced cruise lines to shorten port stays and drop some calls. For example, Cunard Line’s Queen Mary 2 will call at Sept-Iles on Oct. 2 due to speed limits implemented for the west section of the Gulf of St. Lawrence. The 151,000-gross-ton liner is one of the largest ships to visit the fishing and mining town of 26,000 people. Emergency rules adopted in mid-August limit all ships over 20 meters long to speeds of 10 mph or less in a vast swath stretching from the northern shore of the St. Lawrence River south to near Prince Edward Island. Cruise ships, which typically motor at 17 or 18 mph in the area, now face fines of up to $25,000 for exceeding 10 mph in the restricted zone. Canadian minister of transport Marc Garneau said the slowdown will stay in place until the endangered whales migrate out of the region, which could be sometime in September or October. But a half-dozen cruise lines have already adapted their schedules to the slower cruising speeds, shaving hours off of stays in ports to make up the difference or moving their ships to spend more time out of the restricted zone. One port that has been impacted is the small Canadian town of Gaspe on the western shore of the Gulf of St. Lawrence. 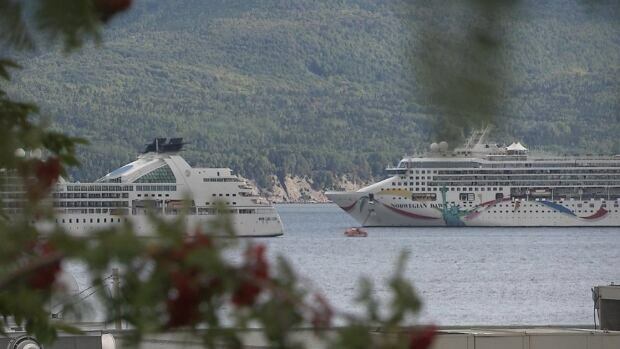 Cruise lines that have dropped calls there include Norwegian Cruise Line and Regent Seven Seas Cruises. Gaspe mayor Daniel Cote estimated that the town of 15,000 will lose about $2.5 million as a result. The port of Sept-Iles in Quebec. 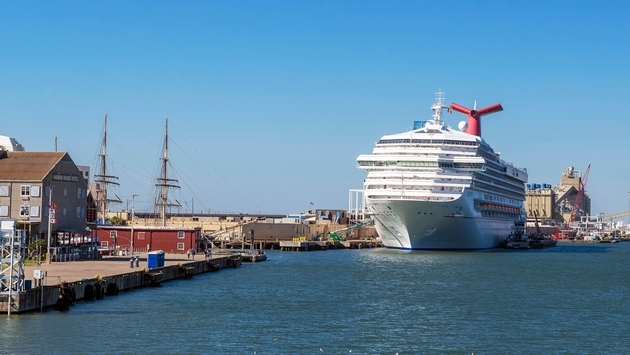 Also affected has been the Port of Charlottetown on Prince Edward Island, which will lose an estimated 8,000 cruise passengers this season as a result of 10 canceled calls from several cruise lines. But some communities are benefitting. 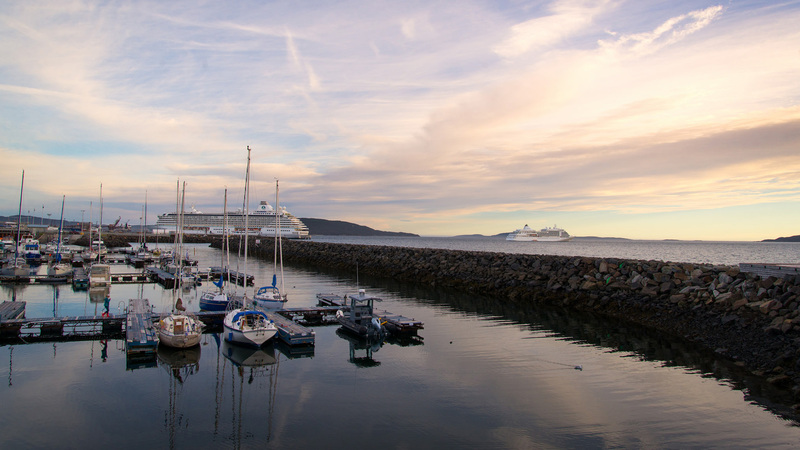 As cruise lines revised their itineraries, Sydney, Nova Scotia, gained two calls from the Norwegian Dawn, two from the Seven Seas Mariner and one from the Silver Whisper, said Nicole MacAulay, acting manager of cruise marketing for the Port of Sydney. “We’re well outside of the [slow-speed] zone,” MacAulay said. Last year, Sept-Iles had a total of four cruise ship calls. Cunard’s first call there was scheduled to happen in 2018, but the line requested to go there at the last minute to limit the impact of speed restictions. Most cruise lines say their primary response has been to shorten port calls to gain added cruising time. Holland America Line, for example, has shifted departure or arrival times by about an hour on either end of stops for its four ships that sail itineraries between Quebec City and Charlottetown. Transport Canada and the Canadian Department of Oceans and Fisheries announced the reduced-speed zone on Aug. 11 after 10 whale deaths in the gulf since June 7. Fishing gear entanglements and ship strikes were the apparent causes. Spalding said the migratory pattern for the whales appears to be changing. Previously, they spent more time off the coast of Maine, where there is a defined sanctuary and detection buoys with hydrophones provide real-time information to ship captains about the presence of whales, she said. Ships slowed down when whales were detected. “Once sounds confirm the whales have moved, the restrictions are lifted,” Spalding said. If the migration pattern has changed permanently, a high number of whales in the Gulf of St. Lawrence pose problems for future cruise seasons there, Spalding said. CLIA is working with the Canadian government to address the issue. “We believe there are other ways to be sure ships have better information about where the whales are,” she said.